Woman Walks Ahead, 2018, 101 mins., is adapted from a novel by Eileen Pollack called Woman Walking Ahead: In Search of Caroline Weldon and Sitting Bull. It tells the story of Caroline Weldon, a well-to-do widow and portrait painter from Brooklyn, who, in the late 1890’s, packed her paints and her trunk and made the long, arduous trip west to paint Chief Sitting Bull. (Woman Walks Ahead is the name Sitting Bull and the Lakota Sioux gave her.) Our government attempted to send her back—these were tense times with the Indians—but she meets Sitting Bull and stays, well, I don’t know where she stays for many of the scenes of them together are in his tent, or walking the range, etc. One time, he changes clothes in front of her and there is tense music but that’s about it. Their relationship is the major focus of the film. But if this film is trying to make a case for a more intimate relationship between the two of them, it fails . . . , dismally. Research shows that there was mutual respect and she became his confidante and secretary, but lover? A real stretch—besides, he already had 2 wives. Weldon is played by Jessica Chastain, a fine actress, but wasted here. She dresses in prim ruffled day-dresses and shoes designed for the drawing room; hence, one can easily spot her in a crowd. One time, the director sits her on a big white stallion in her eastern garb, moving through a crowd. The scene made me think of Rembrandt’s Nightwatch in which he tucked his recently departed wife into the canvas. Her otherworldly figure enhances; Chastain just looks silly. On the other hand, Sitting Bull played by Michael Greyeyes almost makes up for that. I looked him up to find that he is a Canadian actor with a Master’s Degree in Theater from Kent State and an accomplished ballet dancer—a tall one at 6’2”. When Caroline first meets this great Chief who brought down Custer, he’s wearing a beat-up floppy hat and old clothes and is on his knees digging up potatoes. This menial task along with his demeanor helped to quickly establish an aura of sadness and resignation combined with a dignity that he maintained throughout the film. Hers is a sad story. We don’t know whether she ran away with a married man on impulse or if her marriage was so unhappy that she had to do something, but her actions, of course, would have destroyed her reputation. Even her son had to feel society’s rebuff—remember, it was the 1800’s. (Funny that men don’t seem to have that problem.} It is logical to assume that when she changed her name and started west with her son, she was hoping to start over, to leave that past behind. Her support of the Sioux and their plight is recorded. There just wasn’t anything left to do. 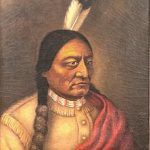 The Senate had already passed the Dawes Act which gave the government the right to place the Indians on small reservations so they could send settlers to what would become North and South Dakota. She was too late, but she tried. She did what she could. There’s a cemetery in Scotland on the North Sea with a grave tucked in near the wall that has the epitaph, ‘She did what she could’. Caroline Weldon made me think of it. 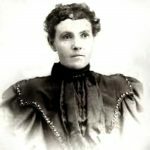 She was brave; she was kind—even spending her meager fortune to help feed the Sioux, and she wanted to make a difference. She tried; she did what she could which is all we should expect from anyone.. She deserved better than this film. I’m giving this film 2 carats, one for making us aware of Weldon. In fact, last year, after the film came out, Greenwood Cemetery in Brooklyn had a trolley tour in March during Women’s History Month called ‘Women who walked Ahead’ and featured Weldon’s grave. It likely wouldn’t have happened without the film. The second carat is for making me think about Native Americans. . We don’t see much about them. Oh, there’s the Lone Ranger and Tonto but we have to think hard to come up with much else. They are our dirty linen. Did you know that our government even killed all the buffalo so the Sioux would lose their source of food and become dependent, easier to control? By the way, Caroline Weldon painted 4 canvases of Sitting Bull. Two still exist – one is held by the North Dakota Historical Society in Bismarck, ND and the other at the Historic Arkansas Museum in Little Rock, Ark. Go see them. Far From the Madding Crowd, a Victorian Delight! Far From the Madding Crowd, 2016, 110 mins., is a film adaptation of the novel by the same name written by the Victorian poet and writer, Thomas Hardy. There are three earlier versions, the latest before this one was 1967 with Julie Christie. Hence, if you become a fan of this new one, you can veg-out on three or even four if they are available. Not having done that or, alas, read the novel, this film generated a few questions right off. First, that his heroine is named Bathsheba made my antennae go up. Had he modeled his Bathsheba after that grand Jewish Matriarch from the Bible, I asked myself? Having conjured her up and written her memoir for my book ‘Daughters of Eve: a Herstory Book’ (Available on Amazon), I do consider myself something of an authority on her nature and I was eager to see what he had produced. I decided he simply fancied the name. For Hardy, the story is also the thing and the perfect thing for a Victorian writer where strong characters might lead to emotions that a Victorian audience would think unseemly. Bathsheba, delightfully played by Carey Mulligan, starts out strong. She inherits her uncle’s farm—a large tenant farm—and is determined to make it the best farm around. She also attracts three very different suitors: a sheep farmer, Gabriel Fox played by maddingly handsome Matthias Schoenaerts; a landed gentry and proper Victorian William Boldwood played by Michael Sheen, whose land borders hers; and a soldier scoundrel, Frank Troy, played by Tom Sturbridge. She receives proper marriage proposals from the first two and still plans to go it alone but then the soldier shows up, kisses her several times—and I do mean just several times–and she rushes off to town to marry him. A totally irrational and impetuous act, but remember, the story’s the thing. I won’t tell you anymore because you should see it. The cinematography in the English Countryside—Dorset, I understand—is well-done and quite lovely and the whole production is charming. I recommend it—but then, I love Victorian. PS: Our Women’s Film Club saw it in February. It was well-received. 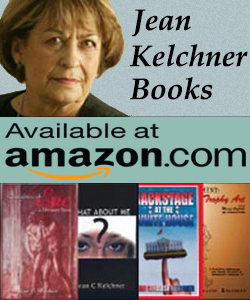 Why did Jean start Writing? Menopause! Yes, that’s right, I started writing fiction when I was teaching English in a Girl’s High School, finishing my Masters in Liberal Studies and going through Menopause—all at the same time. Another sympathetic English teacher and I agreed that if men suffered from it there would be all sorts of cures, so we decided to each come up with an idea for a humorous story. Well, by the time we discussed it again, my idea had turned into a book and characters had begun to take over my head. I was hooked. Backstage at the White House turned out to be a far cry from Menopause and I wrote three other books before I finished it but it all started because of it. Strange things do happen. ‘Everybody’s Fine’, starring Robert DeNiro is a fine film for Father’s Day. I must warn you, however, that I have a friend who won’t watch DeNiro in anything because of his ‘trash talking’ of President Trump. I wasn’t too surprised by it. I’ve watched him in the past on Letterman and he has trouble with conversation. Don’t you think that sometimes people who have trouble putting words together are very good with four-letter ones–and gestures? And let’s face it, in his craft he works with a script. But, should we judge artists by their private lives and actions–or their lack of ability to express themselves properly? That’s a real ponder . . . . . Since Ring Cycle season is coming up at the Met, Richard Wagner comes to mind. By all reports, he was a nasty, unkind man with few scruples. He absconded with his best friend’s wife, rubbed shoulders with the Nazis and belched when he ate, but he wrote some of the most wondrous music ever written and is a towering figure in his art. I don’t approve of what he was but I could never cut him from my life. On the other hand, Robert DeNiro is little more than a ‘Raging Bull’. 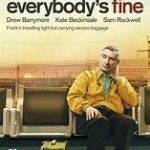 I could easily join my friend and give DeNiro up–he’s done little that I fancy–but if I had, I would have missed his fine performance in Everybody’s Fine. DeNiro plays Frank, a recent widower and recent retired factory worker (he coated power wires with PVC tubing) who is expecting his four children home for a little reunion. When they begin to cancel at the last minute, he packs a bag and, against doctor’s advice, goes on a road trip to visit them. He winds up learning a lot about his children but even more about himself. And my question? Well, I’m still pondering . . . . . . . How about you? Favorite moment: With Frank in the art store when he is shown his son’s painting of telephone poles. I have Trouble with Abortion. I have trouble with abortion. I think any thoughtful human being should. It’s just not black and white. Cowardly, I do my best to ignore it, but this week it reared its perplexing head again with Ireland’s decision to overturn its abortion ban. Now, Ireland has had the strongest abortion laws in Europe. Even taking an abortion pill could get you 14 years in prison and if there was a fetal heartbeat, a woman could die before she could get an abortion no matter the condition of the fetus. That’s what happened to 31 year old Savita Halappanavar, a dentist who had immigrated from India with her husband. I was in Ireland in August of 2013 when the newspapers were frustrated with her death and Irish women marched. She and her husband had begged the doctors for a therapeutic abortion even arguing that they were neither Irish nor Catholic, but that heartbeat did her in. When the less that human fetus aborted, she was so riddled with infection that she died three days later. That bothers me. It’s not just black and white. Not long after, I read that a woman in England who found she was having twins aborted one fetus because she said that she couldn’t afford to raise two. That bothers me too. It’s not just black and white. I have trouble with Abortion. How to Make an American Quilt, 1995, 117 mins. . . .
Winona Ryder stars as Finn, a graduate student at Berkeley attempting to finish her thesis. She’s changed the topic four times and has the same trouble committing to her live-in boyfriend, Dermot Mulroney. Finn decides to spend a month with her grandmother, Ellen Burstyn, who lives with her sister, Anne Bancroft, in a big old house by an orange orchard. Finn arrives into a Quilting Bee which includes five other women, Jean Simmons, Lois Smith, Kate Nelligan, Maya Angelou, and Alfre Woodard. As they stitch squares for a quilt themed ‘where love resides’ they attempt to help Finn with stories (shown in flashbacks) of their own marriages. Favorite moment: The women tell her the quilt is for her. Fun Fact: taken from a novel by Whitney Otto that started out as her Master’s thesis. 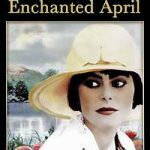 Enchanted April, 1991, 101 mins. The only way to have a Women’s Film Club is to show strong women’s films. Enchanted April is one of my favorites. It’s a 1922 book by Elizabeth von Arnim that became a Play that became a Musical that became an idyllic Woman’s Film. To start with, it’s very pretty and we like pretty. It’s focus is four women at crossroads—two are in drowsy marriages, one is a lonely widow tired of just living on memories, and one, a glamorous heiress bored with the artificiality in her life. Can a man enjoy it? Sure, but it’s only fully understood by a woman. For example, can a man fully understand that anyone, for that matter, might like to spend a month with three women she just met, in a villa in Italy basking in the warm Mediterranean sun? Well, when I put it that way . . . maybe, but still not with the same sensitivities. So when Lottie in rainy London sees an ad for a villa for rent in sunny Italy she knows she has to go. She invites Rose who goes to the same women’s club and they advertise and get Caroline, an elegant upper-class beauty and Mrs. Fisher, a bossy aging widow. By the end of the month, the husbands of Lottie and Rose have arrived, Caroline is enchanted by the villa owner and Mrs. Fisher has new friends. Favorite Moment: As they leave, Mrs. Fisher sticks her wooden cane down in the dirt and moves forward—not looking back–and we are left to watch the cane burst forth with colorful flora symbolic of new beginnings for all. In other words, it has a ‘happy ever after’ ending that is quite satisfying. Director: Mike Newell. Cast includes Miranda Richardson, Josie Lawrence, Joan Plowright, Alfred Molina, Michael Kitchen and Jim Broadbent. Froth: Dame Joan Plowright is also Baroness Olivier, the widow of Sir|Baron Laurence Olivier and is a distinguished English actress in her own right. She retired not long after making this film when she lost her sight from macular degeneration. Thought to ponder: Why do you think the women invited their husbands on their holiday? Two Months in but Still Hoping . . .
Emily Dickinson wrote—Hope is the thing with feathers that perches in the soul—and sings the tune without the words—and never stops—at all. I hope—all those reading this and all whom I hold dear—will have a Healthy, Prosperous and Happy—New Year . . . I hope—this world will be a kinder and gentler place—with peace and goodwill for all—and that Mother Nature will give a break—no floods, no fires, no storms—that would be good for everyone’s sake . . . I hope—that I find some dress shoes that won’t hurt my feet—and that our President will think to tweak before he Tweets. I hope—my novel Backstage at the White House will find the audience it deserves—and President Forbes and Stacey Lee’s story will finally be heard . . . I hope that you will add your hope—however, don’t forget to rhyme—after all—Emily did it all the thyme. Start a Film Club for Women in your Community, your Neighborhood, or just with a few Friends. I did! About ten years ago, my husband and I moved to a ’55 and older’ community—we had satisfied that requirement some years earlier. Everything was new from our house to the clubhouse; in fact, the community was less than half built and the sounds of construction were all around us, but we were more than ready for a new home on one floor in a gated community, sitting on a hill overlooking New York City. Sounds nice? It is. One day, early on, relaxing at the Clubhouse with that view and the leisure director, I sighed and suggested that maybe it would be nice to start a Koffee Klatch for women and watch a film about women and discuss it. “I”, I said, had collected a few women’s films, or—as men like to say, ‘Chick Flicks’—that were really good and worthy of such an endeavor. And that’s how it all began! We had 8 to 10 women show up for that first film. Ten years later, we have over 150 members and have seen over 100 films focused on women and women issues. We meet at 9am on the 1st Wednesday of every month and begin with a Coffee and . . . which is now more like a Continental Breakfast with fruit, bagel and pastry. The chatter and laughter over coffee make life good, and I even feel a bit guilty when I have to break it up to watch the film, but only a bit because I know that they enjoy the discussion after the film as much as they do the chatter before. SO, if you’re part of a community, believe me, ‘if you start it, they will come’ or if you like to get together with your friends and don’t have time to read a book every month, DO FILMS, GOOD WOMEN’S FILMS. Write me if you have questions or stop by for film ideas and discussion questions. And remember–HAVE FUN!! !